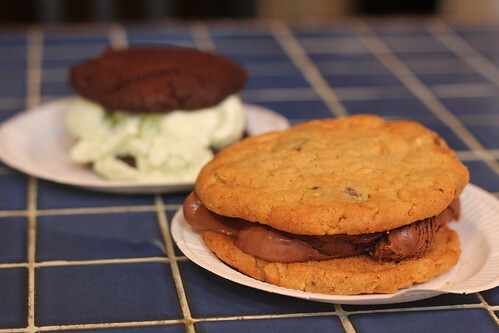 Blondie and Brownie: Ice Cream Sandwiches at Milk & Cookies! It's hard work bathing suit shopping this time of year. Every store seems to have moved onto coats and boots. What about us with bathing suits and sandals that need replacing? I got about another month of beaching to do here! There's surfing to be done! Ugh, frustrating. So I comforted myself with an ice cream sandwich in the West Village. Milk & Cookies has been around for years, yet I had never tried it out for myself. Wrong move. 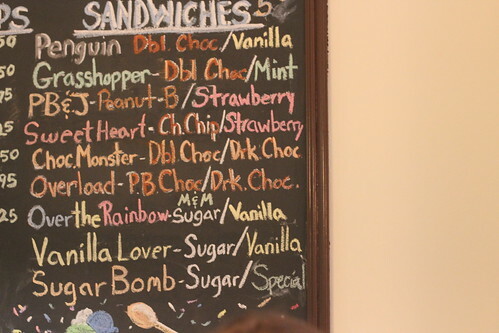 The ice cream sandwiches are made with il laboratorio del gelato, the cookies being made in house, naturally. They have a bunch of delicious flavor combinations, but I decided to go with the Overload--peanut butter and chocolate is one of my most favorite flavor combos. My friend went with the Grasshopper and liked it enough, but wished she had mine. These sandwiches are a win if you get a bigger cookie base. You'll get the same amount of ice cream, but the spreading means less chance of a ice cream cookie sandwich mashing, though the chewy cookies did prevent any epic failure. The con with bigger cookies did mean more melting onto your hand. I definitely need to stop by again soon to try more treats!